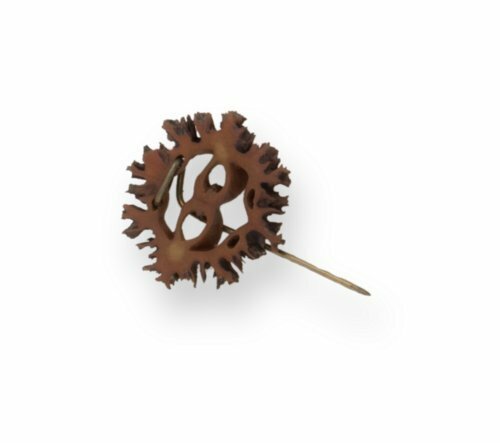 Small lapel pin made of the cross-section of a butternut nut rind, and fixed with a brass pin shaft. One end of a length of brass wire has been wrapped through holes in the rind, and extends straight below it to form a short pin shaft. This pin was taken from a Southern sympathizer in Davenport, Iowa, during the Civil War. Butternuts or Copperheads made up the extreme pacifist element in the Democratic Party during the war. They tended to be ex-southerners living north of the Ohio River who hoped to end the war and restore the Union with slavery. These individuals declared their loyalties by wearing pins made of butternuts or heads cut from copper pennies. The cross-section of a butternut rind forms two joined hearts, which the Butternuts claimed signified the inseparable North and South.